To stick with our theme of winter drinks, here is one that will make your cardiologist cringe. But as we all know, anytime you are using butter in a cocktail, good things are going to happen! The Hot Buttered Rum is one of those gluttonous pleasures that would not cross your mind eleven months out of the year, but when candy canes and cookie trays constitute a balanced breakfast a Hot Buttered Rum is the perfect drink to end a long day. 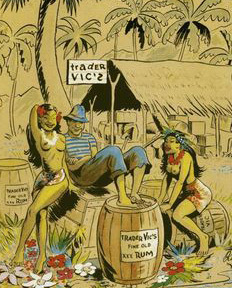 While I have found no evidence to support his creation of the drink, Victor Jules Bergeron, Jr., also known as Trader Vic, definitely made it popular. It appeared in “Trader Vic's Book of Food & Drink,” published originally in 1946. To make this delightfully decedent treat you need to make a batch of butter batter first. Place one stick of butter at room temperature into a mixing bowl with a pinch of salt, add a quarter teaspoon each of ground cinnamon, nutmeg and cloves. Beat until the butter is creamed and the spices are well mixed. Slowly, add one pound of brown sugar and continue to mix. Store the batter in the refrigerator. When ready to make the cocktail place one to two heaping teaspoons into a mug, add two ounces of dark rum (I’m currently using Myer’s), and fill with boiling water. Serve with a cinnamon stick and an angioplasty tenth one’s free punch card. Cream the butter, salt and spices in a mixing bowl, add sugar and mix. Store in the refrigerator until ready for use. For each drink place 1 to 2 teaspoons of the butter batter into a mug, add 2 ounces of dark rum and fill with boiling water. Garnish with a cinnamon stick.